San Francisco truly is “The Jewel Of Northern California”. This city never stops. San Francisco’s heart-stopping landscapes, electrifying attractions and authentic food places are the reasons backing this well-suited title. San Francisco is one of the most visited destinations because of its world acclaimed attractions. 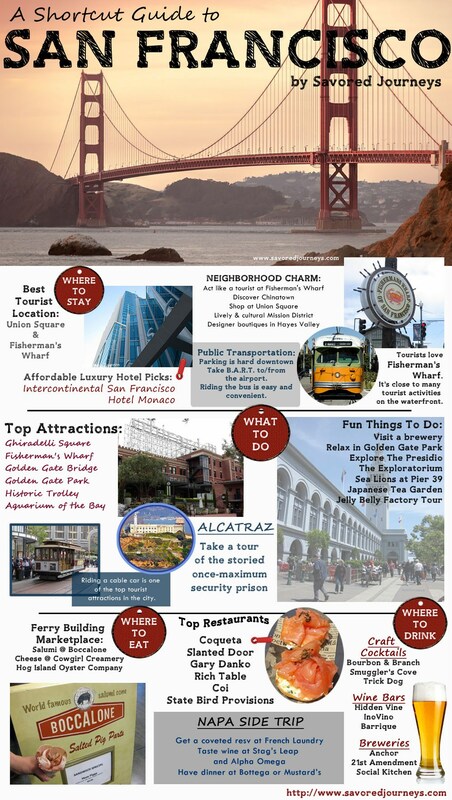 Infographic given below by Savored Journey is a complete shortcut guide to everything you are looking for in San Francisco- from it’s famous attractions, top restaurants and prudent hotels. If this is your first time in San Francisco, start with some major attractions and activities! The Golden Gate Bridge, the most famous bridge in the world, manages to impress even the most veteran travelers. San Francisco Cable Car has been transporting people since late 19th century. They are world famous for its rides and for sure city sightseeing in San Francisco is incomplete without experiencing a spectacular view from the Cable Car. Then comes Fisherman’s Wharf, which is famous for the most vivid activities. San Francisco is also a home to the coolest bars and restaurants. The Ferry building marketplace is the best place to grab your favorite dishes. There are countless places to visit and things to do in this city.